“At that point I knew that’s what he was going to be,” Willis said. That was more than a decade ago. 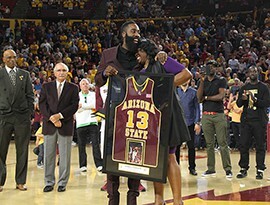 So when Harden, the NBA All-Star and Sun Devil basketball legend, returned to Wells Fargo Arena Wednesday night to alternating chants of A-S-U and M-V-P to have his jersey No. 13 honored, his mother couldn’t have been surprised. But she and her son were still emotional. Harden credits his mother as the biggest influence in his life. She would drive to see him play and there was no way she was not going to be by his side on his special night in front of a sea of gold cheering him on. Harden is only 25 but it will be tough to find someone who wouldn’t agree he’s special. In 2009 his 704 points ranked fourth in single-season history for ASU. He became ASU’s third Pac-10 Player of the Year and was named a consensus First Team All-American, the first Sun Devil in history to do so. Harden’s Sun Devils teams went 46-23 in his two years, including 5-0 against rival Arizona. His success didn’t end in college. The Oklahoma City Thunder made Harden the third overall selection in the 2009 NBA Draft. Across six seasons in the NBA with Oklahoma City and the Houston Rockets, Harden has been named an All-Star three times and is the current NBA scoring leader with 27.4 points per game. Scott Pera was his high school coach at Artesia High School in Lakewood, California and was an assistant at ASU when Harden was there. But even Pera couldn’t have foreseen the success Harden has had. “You only dream about these things and I encouraged him to dream,” Pera said. “You got to have a combination of things happen. He had a growth spurt, he had an incredible work ethic, an incredible mother, they came to a school that really helped foster and develop him. As far as individual accomplishments go, Harden did it all in college. As for the NBA, there is only one left,and if the ASU fans chanting MVP have their way, he might be inching closer. 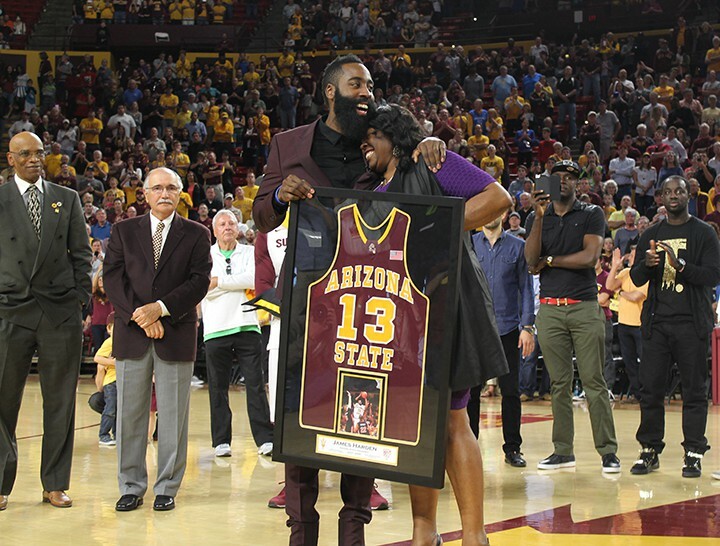 Former ASU men’s basketball star James Harden shares a special moment with his mother as he gets his number retired at Wells Fargo Arena.